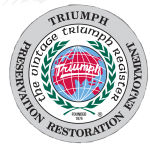 In order to promote more participation in the Concours d’Elegance events at national and regional conventions, the Vintage Triumph Register recently added a new Modified class. Where we previously had just one Modified class, we now have Modified Touring and Modified Prepared. This is intended to differentiate between those cars that are modified to improve reliability and ease of maintenance (Touring), and those with major modifications for performance (Prepared). Of course, we also have the Showroom Stock class, with multiple divisions for the different Triumph models. The goal for Showroom Stock is to match the way the model appeared and functioned when it left the dealer showroom as new. And finally, there are the Senior and Preservation classes for those cars that have won Concours awards before.